The Solution below shows the E major plagal cadence on the piano and treble clef. This step shows the plagal cadence in the key of E major. So in this major key, we are going from the E major triad chord #IV - A major chord, to E major triad chord #I - E major chord. To demonstrate this, on the treble clef above, chords E major triad chord #I and E major triad chord #V are used to set up the phrase as being in this key, then the cadence chords IV and I finish off the phrase, giving only a partial sense of completion, in comparison to the E major perfect authentic cadence. 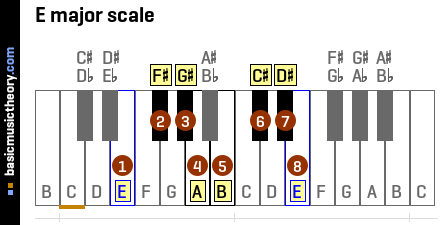 This step shows the E major scale notes and the triad chords in that scale. Before describing the details of the plagal cadence in the key of E major, first it would be to useful to identify the scale notes, degrees and chords that could be used in this key. Below is a piano diagram showing the E major scale notes. 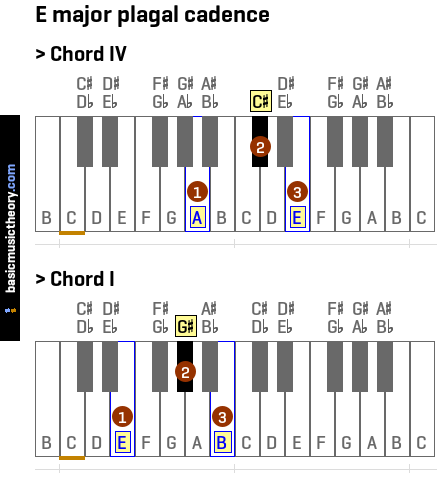 For details on all the chords in this scale, have a look at E major triad chords, and E major 7th chords, but a summary table of all chord names and their scale degrees is shown below. To understand what the roman numerals mean, please look at E major triad chords or E major 7th chords. This step shows the E major plagal cadence on the piano and treble clef. So looking up the chords relating to these scale degrees from the table above, we are going from the E major triad chord #IV - A major chord, to E major triad chord #I - E major chord. It is a weaker closure than the E major perfect authentic cadence, whose dominant to tonic motion is the most important relationship in a diatonic scale, and gives the strongest sense of closure of all cadences. The first two chords on the staff below are not strictly part of the cadence, but they are useful to set the expectation that this phrase is definitely in the key of E major. To do this, we are using chords E major triad chord #I and E major triad chord #V, and after hearing these chords, the ear could expect to hear chord I again. If instead the E major triad chord #IV is inserted before the final chord I, this gives less sense of closure and completion than arriving at chord I directly from chord V.